Nebraska death penalty petition suspends new law, triggers November 2016 referendum. 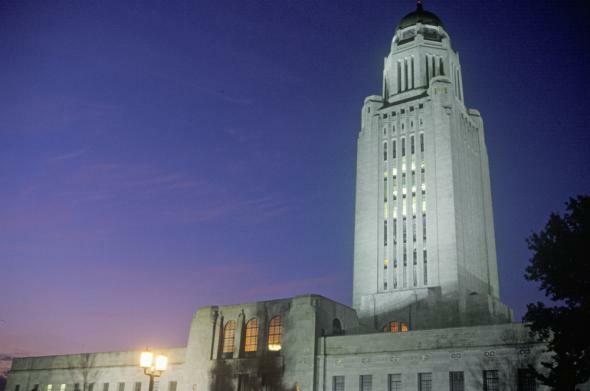 The Nebraska state capitol building in Lincoln. Nebraska Secretary of State John Gale said Friday that he has sent letters certifying the success of the petition drive mounted by Nebraskans for the Death Penalty, a group backed by Gov. Pete Ricketts. Nebraskans for the Death Penalty needed to collect at least 56,942 signatures, or 5 percent of the state’s registered voters, to place a death penalty referendum on the ballot. Signatures from at least 10 percent of voters, or 113,883, were required to keep the repeal from going into effect. “More than 143,000 signatures were verified to our office from counties where signatures were collected, which was more than enough to meet each of those thresholds,” Gale said in a press release. Nebraska has not actually executed a prisoner since 1997, and the fate of the 10 prisoners on the state’s death row was unclear even before this latest legal twist; in addition to the constitutional questions involved after multiple changes to the law, the state does not currently possess the drugs required to carry out a lethal injection, which is the method of execution mandated by Nebraska statute. An April ACLU poll found that Nebraskans supported the idea of replacing the death penalty with life sentences by a margin of 47 to 35 percent with 17 percent undecided.